These Farm Heroes level 50 cheats and tips will help you beat level 50 of Farm Heroes. 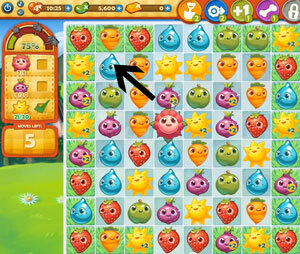 The objective of Farm Heroes level 50 is to collect 8 flowers, 22 onions, and 22 suns in 30 moves. In this level you have 20 moves to collect 8 flowers, 20 onions and 20 suns. There are 8 flowers in the center of the board that you should focus on opening up first. When you make matches near the flowers, they will open up and eventually bloom. Once they are collected, the board will also open up to allow more resources on the board. 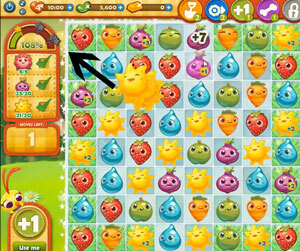 In Farm Heroes Saga level 50, there is a border of grass around the outside. Try to create combinations vertically or horizontally to take advantage of the extra points. The grass is a great way to use your moves more efficiently. While focusing on the flowers, do not let an opportunity pass by that could get you multiple points. If you are able to collect all of the resources within your move limit and have moves left over, the Hero Mode will activate. 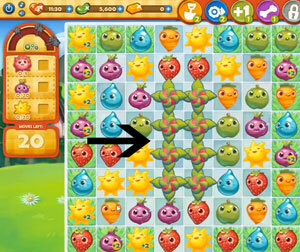 During Hero Mode try to create large combinations to increase your growth level and achieve three stars. If possible try to create combinations with resources that have extra points attached.